1عضو هیات علمی، بخش تحقیقات اصلاح و تهیه نهال و بذر، مرکز تحقیقات، آموزش کشاورزی و منابع طبیعی خراسان رضوی. 3محقق، بخش تحقیقات اصلاح و تهیه نهال و بذر، مرکز تحقیقات، آموزش کشاورزی و منابع طبیعی خراسان رضوی. به‌منظور بررسی اثر تراکم و وزن بنه مادری بر ویژگی‌های زراعی و رفتار بنه‌های دختری زعفران آزمایشی طی سال‌های 93-1389 به‌صورت اسپلیت پلات در زمان در قالب بلوک‌های کامل تصادفی با 12 تیمار و سه تکرار در مزرعه تحقیقاتی مرکز تحقیقات کشاورزی و منابع طبیعی خراسان رضوی به اجرا درآمد. عامل‌های مورد بررسی در آزمایش شامل سه سطح تراکم بنه (40،،80 و 160 بنه در مترمربع) و چهار سطح وزن اولیه بنه‌های مادری شامل (3 ≥، 6-3، 9-6 و 12-9 گرم) بودند که به‌صورت فاکتوریل در کرت‌های اصلی و عامل زمان در کرت‌های فرعی قرار گرفتند. نتایج حاصل از تجزیه واریانس نشان داد که اثر تراکم، وزن بنه مادری و سال بر وزن بنه‌های دختری، معنی‌دار بود. اما اثر متقابل تراکم × وزن بنه مادری و همچنین اثر متقابل تراکم × وزن بنه مادری × سال برای اکثر صفات اندازه‌گیری شده معنی‌دار نبود. نتایج مقایسه میانگین اثر تراکم × وزن بنه مادی بر تعداد بنه‌های دختری نشان داد که در بین تیمارهای مورد آزمایش استفاده از بنه‌های مادری 12-9 گرم با تراکم 160 بنه در مترمربع بیشترین تولید تعداد کل بنه‌های دختری (771 در مترمربع) در واحد سطح را به همراه داشت. بنه‌های مادری با وزن بالاتر، تعداد بنه‌های دختری بیشتری در گروه‌های وزنی مختلف تولید نموده‌اند. همچنین نتایج نشان داد که بنه‌های مادری در گروه‌های وزنی کمتر قادر به تولید بنه‌های دختری با وزن بیشتر از وزن بنه مادری اولیه بودند. با افزایش تراکم و وزن بنه مادری تعداد گل، وزن گل و عملکرد کلاله خشک به‌طور معنی‌داری افزایش یافت، به‌طوری‌که بیشترین وزن خشک کلاله زعفران در واحد سطح (65/0 گرم بر مترمربع) از بنه‌های مادری با وزن 12-9 گرم به دست آمد. 2Researcher, Seed and Plant Improvement Recearch Departement, Research and Education Center of Agricultural and Natural Resources, Khorasan, Iran. 3Researcher, Seed and Plant Improvement Recearch Departement, Research and Education Center of Agricultural and Natural Resources, Khorasan, Iran. 4M.Sc.of Jahade- Keshavarzi Organization, Khorasan Razavi, Mashhad, Iran. In order to investigate the effect of planting density and maternal corm weight on some characteristics of daughter corms and agronomic characteristics of saffron (Crocus sativus L.) a field experiment was conducted at the Agricultural and Natural Resources Research Center of Mashhad. This experiment was carried out as a factorial split plot in time based on complete block design with three replications and 12 treatments during the years 2010-2014. The experimental factors were 3 levels of density (40, 80 and160 corm in m2) and 4 levels of mother corm weight (≤3, 3-6, 6-9 and 9-12 g per corm) as a main plot and time as a sub plot. The results showed that density, maternal corm weight and year had significant effects on daughter corm’s weight, but the effect of interaction density × corm weight and density × weight × year were not significant for the most characteristics. The mean comparison of interaction effect of density × weight for number of daughter corm showed that maternal corm weight (9-12 g) × planting density (160 m2) had the highest number for daughter corms (771 m2). Maternal corms with higher initial weight produced the highest number of corms in different corm classes. In addition, the results showed that maternal corm with lower initial weight produced heavy daughter corms compared to other maternal corm weight classes. Flower weight and stigma dry weight of saffron (m2) were increased by increasing planting density and maternal corm weight flower number. The highest dry stigma (0.65 g.m-2) yield was produced by maternal corm (9-12 g per corm) weight class. Alavi Shahri, H., Mohajeri, M., and Falaki, M.A. 1994. Investigation of plant density (planting distance) on saffron yield. Abstract Book of 2nd Saffron and Medicinal Plant Cultivation Conference. 8-9-Novebmer. Gonabad, Iran. (In Persian). Alipoor Miandehi, Z., Mahmoodi, S., Behdani, M.A., and Sayyari, M.H. 2015. Effects of corm weight and application of fertilizer types on some growth characteristics and yield of saffron (Crocus sativus L.) under Mahvelat conditions. Journal of Saffron Research 2 (2): 97-112. (In Persian with English Summary). Amirghasemi, T. 2001. Saffron, the red gold of Iran. Nashre Ayandegan Press, Tehran, Iran. 112 pp. (In Persian). Dabbagh Mohammadi Nasab, A., Javanshir, A., Aliari, H., and Moghaddam, M. 2004. Consideration competition in soybean and sorghum intercropping by yield contrary model. Journal of Agriculture Science and Natural Resources10: 120-130. (In Persian). Forakinejad, Z. 2008. Saffron, red gold of Iran. Journal of Teaching Biology 22 (2): 62. (In Persian). Gresta, F., Avola, G., Lombardo, G.M., Siracusa, L., and Ruberto, G., 2009. Analysis of flowering, stigmas yield and qualitative traits of saffron (Crocus sativus L.) as affected by environmental conditions. Scientia Horticultureae 119: 320–324. Gresta, F., Lombardo, G.M., and Avola, G. 2010. Saffron stigmas production as affected by soil texture. Acta Horticulturae 850: 149-152. Hassanzadeh aval, F., Rezvanimoghadam, p., Bananayan aval, M., and Khorasani, R. 2013. Effects of maternal corm weight and different of cow manure on corm and flower yield of Saffron (Crocus sativus L.). Saffron Agronomy & Technology 1: 22–39. (In Persian with English Summary). Hosseini, A. 2013. Newsletter of Scientific Network for medicinal plants. (In Persian). Koocheki, A., Najibnia, S., and Lalehgani, B. 2009. Evaluation of saffron yield (Crocus sativus) in intercropping with cereals, pulses and medicinal plants. 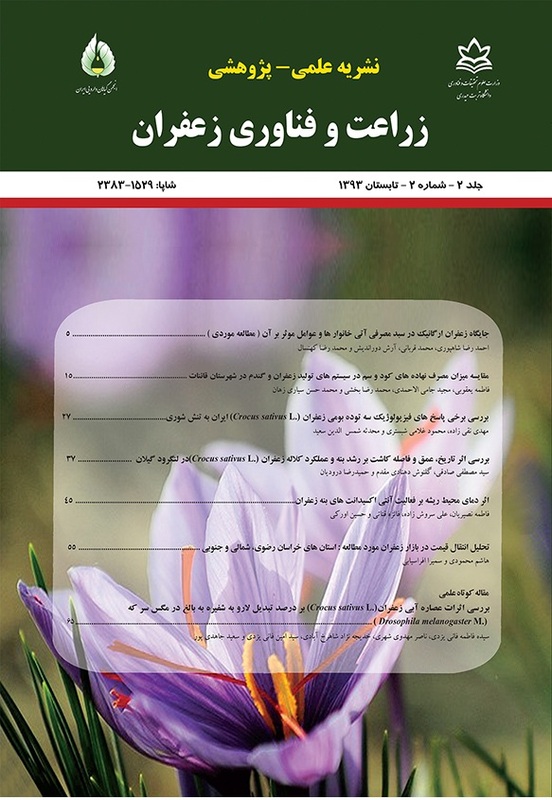 Iranian Journal of Field Crop Research 7: 173-182. (In Persian). Koocheki, A., Rezvani Moghaddam, P., Molafilabi, A., and Seyedi, M. 2013. The effects of high corm density and manure on agronomic characteristics and corms behavior of Saffron (Crocus sativus L.) in the second year. Journal of Saffron Research 2:144-155. (In Persian with English Summary). Koocheki, A., Seyyedi, S.M., Azizi, H., and Shahriyari, R. 2014 c. The effects of mother corm size, organic fertilizers and micronutrient foliar application on corm yield and phosphorus uptake of saffron (Crocus sativus L.). Saffron Agronomy and Technology 2: 3–16. (In Persian with English Summary). Mohamad-Abadi, A.A., Rezvani-Moghadam, P., and Sabori, A. 2007. Effect of plant distance on flower yield and qualitative and quantitative characteristics of forage production of saffron in Mashhad conditions. Acta Horticulturae (ISHS) 739: 151-153. Molina, R.V., Valero, M., Navarro, Y., Gurdiola, J.L., and Garcia-Luice, A. 2005. Temperature effects on flower formation in saffron (Crocus sativa L.). Scientia Horticulture 103: 361- 379. Mollafilabi, A., Koocheki, A., Rezvani Moghaddam, P., and Nassiri Mahallati, M. 2014. Effect of plant density and corm weight on yield and yield components of saffron (Crocus sativus L.) under soil, hydroponic and plastic tunnel cultivation. Saffron Agronomy & Technology 1 (2): 14-28. (In Persian with English Summary). Naderi Darbaghshahi, M.R., Khajebashi S.M., Banitaba, S.A., and Dehdashti, S.M., 2009. Effects of planting method, density and depth on yield and production period of saffron (Crocus sativus L.) in Isfahan region. Seed and Plant 24: 643–657. (In Persian with English Summary). Nassiri-Mahallati, M., Koocheki, A., Boroumand, Z., and Tabrizi, L. 2007. Effects of corm size and storage period on allocation of assimilates in different parts of saffron plant (Crocus sativus L.). Iranian Journal of Field Crops Research 5 (1): 155-165. (In Persian with English Summary). Permeh, Z., Hosseini, M.R., Nabizadeh, A., and Mohebbi, H. R. 2009. Export potential and goal markets of Iran saffron. Iranian Journal of Trade Studies 51: 59-95. (In Persian). Sadeghi, B. 1997. Effect of storage and sowing date of corm on saffron flowering. Organization of Scientific and Industrial of Iran. Research Center of Khorasan pp.6-53. (In Persian). SAS. 2002. Procedures Guide. SAS Institute, Cary, NC. Statistical yearbook of Khorasan-e-Razavi Province. 2013. Department of Agricultural Statistics. Jihad-e-Agriculture Organization in Khorasan-e-Razavi Province. (In Persian). Temperini, O., Rea, R., Temperini, A., Colla, G., and Rouphael, Y. 2009. Evaluation of saffron (Crocus sativus L.) producation in Italy: Effects of the age of saffron fields and plant density. Journal of food Agriculture and Environment 7: 19-23.